All right, so you have your WRX, and are ready to start unleashing the full potential of the car. So what is the first thing to do? Exhaust? Re-flash? A Bigger Turbo? We made sure that all the fundamental systems of our car were in good working order before we bought it, so now we are about to start modifying it. But getting more power out of our car means putting more stress and strain on our engine and drivetrain than they are used to seeing. The first and best thing we can do to help them hold up the demands that we are going to be putting on them is to make sure that we are using the best possible fluids. It is pretty well agreed upon that synthetic oil is better able to keep your engine and transmission lubricated, especially under hard driving conditions. This is because Synthetic's maintain their viscosity better than conventional oil under higher temperatures and pressures. Sure, synthetic oil changes cost a little more, but the benefits in the long term are well worth the added expense, especially in a turbocharged engine. We decided to go with Redline motor and gear oil. What makes Redline really neat is polyol ester. If you haven’t heard of polyol ester, don’t feel bad, I hadn’t either. But here is why it is really cool. Redline uses polyol ester as their base for their synthetic oils because it is the only lubricant able to withstand extremely high temperatures in modern jet engines. So they will be right at home in our turbocharged engine. It also has natural multi-grade properties, which means that they don’t need to add any potentially unstable thickeners to their oil. What this means is that the viscosity of Redline oil is substantially more consistent regardless of extreme temperature, hot or cold. So you are going to get the lubrication you need whether the oil is going through a scorching hot turbo, or sitting in your oil pan when it is well below zero. Redline gear oils give your transmission the same level of protection, and they have formulated a wide variety of oils specifically for transmissions and limited-slip differentials. Beyond all that, this is the oil that we have been using in the Flatirons Rally Car for its entire life, and its engine and transmission are still running strong in spite of the brutal conditions we have subjected it to. 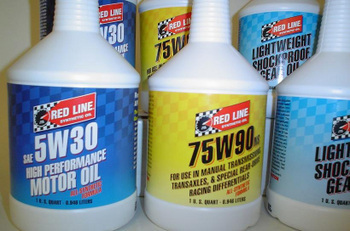 For our car, we are using Redline 5W30 for the engine, Redline 75W90 NS for the transmission because it is specifically formulated to work with synchros, and Redline Lightweight Shockproof for the rear differential. It is a little early to see if the engine oil is making much difference, but what I can tell you is that for the first day or two after putting the 75W90 NS in, the shifter just kept getting smoother. Yep, even reverse seems to be easier to get into. If the other oils are working as well in the engine and differentials, we can be sure that they are getting the protection they need. Sure they look great on your engine, but they do serve a purpose. First, notice how much smoother the silicone hose is than the stock one. 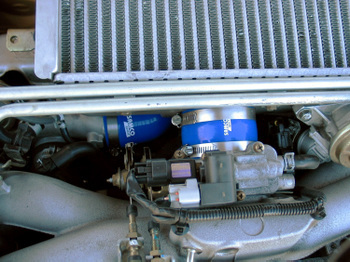 This will make it easier for the intake charge to get into your intercooler, and silicone is much better able to withstand high temperatures and pressures than the stock plastic, so it should last for years. Second, I am sure you will agree that it is a heck of a lot easier to get the silicone hose on and off than the plastic one. A quick note for installation… I do recommend using a little silicone spray, or some kind of lubricant on the hose and the mounting surface to allow it to slide into proper position with ease. 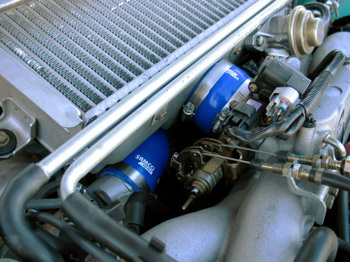 It takes a lot less effort to allow the hose to slid into place than it does to force it, and as the intercooler is over most of the hose, it is difficult to get leverage on the hose. Also, make sure your hose clamps are snug, but not overly tight. If you tighten them down too much, they will just tear your nice new hose. Wow, thanks for this. I never would have understood it better without the help of your post. This headset is just as spectacular as into the picture. That it arrived promptly. I would suggest choosing a towel over every single layer as you click this out w / any steam iron. It does not vapor outside and merely a steamer. That the iron had been required. It is very fragile, so if you cannot trust your self because of the towel and/or steam iron, and then bring things up to a pro. Breathtaking appear.